Unfinished design for a triumphal chariot showing a driving platform decorated with garlands and urns, mounted on two spoked wheels of different sizes. 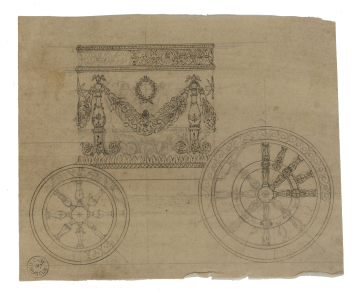 You are here: CollectionsOnline / Unfinished design for a triumphal chariot showing a driving platform decorated with garlands and urns, mounted on two spoked wheels of different sizes. Unfinished sketch in black chalk showing part of a panel of arabesque decoration. This design is for the triumphal car shown in the Quadriga drawing in Adam vol.7/36, and in less finished form in Adam vol.7/73. It may have been inspired by a print from the series of tempera paintings by Andrea Mantegna (c.1431-1506) of the Triumphs of Caesar. Some form of chariot appears on the apex of the entrance pediment in the elevation for James Adam's Parliament House scheme of 1762/3 (see Adam vol.28/2).